I met Sonya Chung several years ago when I had the pleasure of taking one of her fiction seminars at Columbia University. It was apparent from the very first class that she was a thoughtful, skilled artist, and I have been following her work closely since. Sonya’s second novel, The Loved Ones (Relegation Books), has already received numerous early accolades and is stunning on every level: its prose is precise and evocative in detail, full of sentences and paragraphs to savor. Its plotting is flawless—not once was I able to predict where the story was headed and yet once I reached the end, every preceding action and scene proved inevitable. I read eagerly but patiently, not only because it was so beautifully written and each page was one to linger over, but because the book demands trust and patience with its reader. Chung’s characters entered my dreams and came to life in ways that only the best art allows. I had the pleasure of discussing The Loved Ones with Sonya over lunch and then on email to talk about her process writing this novel, struggles with creating authentic characters who come from different backgrounds, and changes in the publishing world since her first novel. Monica Lewis: I was impressed with how effortlessly you moved from one character’s perspective to another in this book. Can you speak to whose story you see this as and why? Were there characters who were more difficult to speak from? 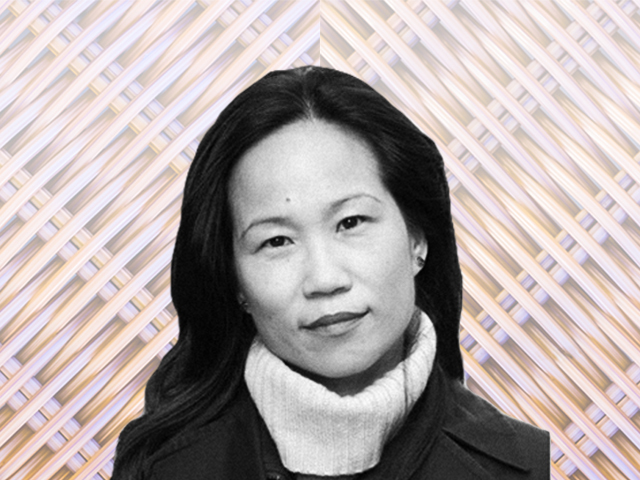 Sonya Chung: I am trying to recall at what point it was clear to me that The Loved Ones would have co-protagonists. Hannah Lee came to me first. She’s the teenage babysitter for the family of Charles Lee. (They share the same last name, but are not related.) I’d recently put away—as in, recognized the failure of—a novel I’d been working on for almost three years. That was devastating, and when I finally got myself back to a new project, I needed to take baby steps, with modest goals. A Korean American girl coming of age in Washington, DC, in the mid-80s—the era and setting of my own adolescence—was territory both familiar and emotionally accessible. I’d also been teaching a course on literature of youth for several years, and had thus steeped myself in wonderful novels and stories about that amazing, traumatic time of life; so I had lots of inspiration. But then Charles came onto the page. His demographics—an African American male, an ex-G.I., born in the 1950s—are as far from my own as a character could get. And yet, his core character—his values, his fears, his desires—felt somehow close. I had to work equally hard to get to know each of them and write them fully. Revision—even in the last stages—was all about digging deeper into both characters and bringing each of them to the end in a satisfying way. Regardless of their superficial similarities to/differences from me, they are both, to my mind, oddities—individuals who are on one hand shaped by their cultures and families and yet distinctly out of sync with them. I knew from the beginning that they would each behave in ways that would unsettle me (and, likely, readers), and at the same time I would fundamentally admire them both. In the end, I suppose the main “character” is their relationship over time, which was really the seed of the novel. It’s been interesting to hear from readers who they feel is the protagonist: some say Hannah, some Charles. Some connect most with Hannah’s parents. I myself sometimes wonder if Veda, Charles’s daughter, isn’t somehow the novel’s center. In any case, I only hope I did all of them justice. The question of who has a “right” to tell whose story often comes up as more and more writers attempt to tell the stories of characters of different backgrounds than their own (especially racially). In The Loved Ones you not only speak from the perspective of multi-generational Korean Americans, but also from multi-generational Black characters, significantly, a Black man. What are your feelings on this potential “issue” as an artist? It’s interesting to follow the issue, particularly when controversy flares up. Why does it sometimes flare up, and sometimes not? The controversy seems to occur when there is a clear institutional power differential between author and character, e.g. a male writing a female, a white person writing a person of color. But even within this parameter, the ignition of controversy is erratic. You don’t hear a lot of passionate critique of, say, Tolstoy, Flaubert, Colm Tóibín, or Norman Rush for writing female protagonists, for example. Adam Johnson did not seem to ruffle feathers with The Orphan Master’s Son, nor Dave Eggers with What is the What or Ann Patchett with Run. Or, maybe the ruffling was just quieter than it’s been with, say, Ben H. Winters. Should there be more ruffling in these other cases? Maybe. But I think each work should be taken individually. As readers and critics, what we have the “right” to do is expect novels and stories to be honest, convincing, compelling; I would add complex, and illuminating in some way. When we start saying so-and-so is not “allowed” to write such-and-such, we reduce all groups of people to single dimensions. The author’s relationship to his characters, in other words, must surpass the institutional blinders that inevitably shape him. Because if not, then why bother? If an author is anything less than deeply engaged in this work in life—the daily work of interrogating one’s blinders—then attempting it in fiction may yield an uninspired and potentially offensive result. If one is doing the work, and has been over time, and the fiction is an organic part of that work, of that evolution, then I can see the potential for the project’s imperative, worth, meaning—for both author and reader. Adichie isn’t insisting that writers all stick to their own demographics; she is suggesting that cross-racial writing can be entered into with uninvestigated motives that generate unidimensional characterizations. And so did you have any hesitations in writing the character of Charles Lee? How did you approach this? What were the difficulties? Well, given these high standards I’ve just described for cross-racial writing… yes, indeed, I had hesitations. That failed novel I mentioned above also featured an African American male character (the story of a decades-long friendship between a black male politician and a Korean American male journalist). When I sat down to start what would become The Loved Ones, I knew cross-racial intimacy—a real and complex relationship across these historically tense racial lines—was something I still wanted to explore and render. Maybe the previous failure, and that my primary interest was in the place of collision/intersection as opposed to a singular racialized portrayal, emboldened me. There is also the complication that I am not white, and I am a female writing a male—so what does that “mean” in terms of the institutional power differential? I really am not sure. Interesting that you knew from the beginning that Charles and Hannah “would each behave in ways that would unsettle [you] (and, likely, readers), and at the same time [you] would fundamentally admire them both.” Throughout the novel, I was nervous that one of them would cross that delicate line and perhaps go too far and lose my empathy as a reader. It’s a huge testament to your skill as a writer and to the beauty of this novel that this never happened. Charles and Hannah are unpredictable and yet their actions and emotions resonate truthfully, and so they came to life to me in a refreshingly natural and meaningful way. In that vein, one of the many aspects of The Loved Ones that struck me is the idea behind the title—how it complicates our notions of love. It is another way in which I found the work to be extremely brave. Without giving plot details away, can you speak to this idea? Like all writers, I treasure the magic and flexibility of language. An expression like “your loved ones” has always crinkled in my ear: it’s passive construction, meaning, “the ones who are loved by you,” and also participates in making the word “love” flimsy, even manipulative, as it has become mostly an expression used in greeting cards, life-insurance commercials, and funeral brochures. By putting the definite article “the” in front, the words reclaim some essence and power. That’s my hope, anyway. And because some of the novel takes place in Paris, I was able also to play with translation: in French, to like and to love are the same word, aimer. And so for the French translation, instead of les proches—the common term for loved ones, i.e. kin—I used bien-aimé. I liked this alternate construction because, again, it makes the words active, i.e. a true loved one is loved well. Your first novel was released by a large press; with this novel, you are publishing with a smaller press. How have the experiences differed for you? How has the publishing process/experience changed since your first novel? Has the literary landscape shifted in any significant ways? The experiences have been like night and day. Some of this has to do with the publishers themselves; some of it with how much publishing has changed since my first novel, Long for This World, was published in 2010; and some with how different my own perspective is this time around. This time around, there is so much happening in the industry, so much movement and energy. Publishing is decentralizing, for sure, and I personally am excited about that. There are passionate, innovative independent presses popping up everywhere—beyond New York—of which my publisher, Relegation Books, is one. The entire process has been a much better fit for me—I have a very DIY approach to life—and fantastic all around: collaborative, nimble, strategic, creative, open to opportunities. It sounds Polly Anna-ish, but truly, publishing with a micro-press has revived my faith in the future of publishing: there’s been something pure about the process, with everyone involved so genuinely devoted to supporting the art of good writing and connecting with real people who share that devotion in order to get the book to its readership (all credit to my talented and tireless publicists Lauren Cerand and Jeff Waxman). Every part of the process has been very personal—I don’t have that cog-in-a-giant-wheel feeling—and I think that’s been both more meaningful and more effective. Did you have any difficulties selling this novel? The Loved Ones made the rounds with big New York publishers, along with some of the larger independent presses, and it did not sell. The feedback from editors was all over the place, so it wasn’t clear if there was some specific flaw. My own feeling is that the book just wasn’t finished-finished; and the larger publishers are less able/willing to take a risk on something that is almost-there-but-not-quite. That’s the beauty of a small press like Relegation: its publisher Dallas Hudgens—a talented fiction writer himself—saw something in The Loved Ones. He believed in it and in me. I was able to work with a fantastic editor, Steven Bauer, on a significant revision process. I am so grateful for that; I needed that faith and investment and time. It’s a huge gift to be able to work seriously on bringing forth your book’s best version of itself within the context of a publisher’s support. There seems to be mounting pressure these days for writers to churn out work after work, as quickly as possible. You founded the website Bloom, “a literary site devoted to highlighting, profiling, reviewing, and interviewing authors whose first major work was published when they were age 40 or older.” What advice can you give to writers at any age on how to resist this pressure to publish early and frequently and stay true to their voice and work? First, nothing good—artistically—comes from impatience. I’ve learned that, a few times over, the hard way. (Read Robin Black—at Bloom—on this.) The most important thing is to Know Thyself when it comes to your creative process and the most fruitful conditions for your productivity. My friend Vanina Marsot and I have decided that we are both the types of writers who need at least six years to write a novel. At least. But anxiety, and its evil cousin envy, are inevitable; we’re only human. I started the column “Post-40 Bloomers” at The Millions—which later became Bloom—out of my own anxiety. I was looking for examples of authors I admired who’d taken their time, taken breaks, persisted through rejection, all that. Or who’d started “late” because they were busy living interesting, engaged lives. The list of such people is endless, and growing. So that’s one bit of advice: immerse yourself in true stories, in order to quiet down those irrational untruths that taunt you in your ear. And, find something productive to do with your anxiety/envy; if it’s there, it won’t go away by pretending it’s not. Monica Lewis lives in Brooklyn, New York and holds an MFA from Columbia University School of the Arts. Her fiction and nonfiction appear or are forthcoming in Apogee, The James Franco Review and Bird's Thumb, and her poetry in Rust + Moth, The Boiler Journal, FLAPPERHOUSE, Yes, Poetry, Breadcrumbs, among others. She has a full-length poetry collection forthcoming in 2017 from Unknown Press. Monica is a VONA/Voices alumna and an assistant editor for NOON.